Already down, coal takes another hit with Greenpeace’s recent spotlight on the water intensive and polluting nature of the coal-to-chemicals industry. So with the price of coal falling and the market flooded with excess coal, is this it for coal? Surely all good news for water as production of coal looks set to slow down. Maybe in the short term but in the long run, coal production in China is set to grow. “a large portion of coal is still expected to be produced by Chinese-controlled companies to ensure energy security. Zhou Dongzhou, Secretary to Board of China Coal, confirmed the push for consolidation. He said at a presentation2 that 30% of Chinese coal companies were running at a loss and that the government were encouraging the consolidation of coal production into the major coal bases. Importation of coal will only make China more vulnerable to external shocks and given that coal is the vanguard, whilst coal imports will rise, a large portion of coal is still expected to be produced by Chinese-controlled companies to ensure energy security. Coalmine-grabs by Chinese companies are preferable, but with the likelihood of opposition by host countries, China’s only real option to quench coal thirst is to adopt aggressive water savings strategies in the extraction and preparation of coal. The 24 bathtubs of water to mine and produce one tonne of coal (2.3m3/t for extraction & 2.5m3/t for washing) could be halved with technology investments. HSBC’s report “China Coal & Power: The water-related challenges of China’s coal & power industries” published in June 2103 confirms our views. Scenarios analysis by HSBC show that the water use caps set by the government for 2015, 2020 and 2030 are too aggressive unless water-savings strategies are adopted. I will not expand on the water intensive nature of turning coal into liquid fuel as Calvin Quek of Greenpeace has discussed this extensively in “Coal-to-Chemicals: Shenhua’s Water Grab”. During a CLSA U roadshow on the “Water & Coal” report issued in April 2013, it was interesting to note that not one of over 30 institutional funds based in Hong Kong and Europe challenged the existence of water risk in China. How to invest around thirsty coal was the favourite question. Given the above analyses and current groundwater crackdown maybe companies that clean up mine tailings or help improve water efficiencies may be a good start. Increased spending appears inevitable – after all, “Energy savings/ Environmental Protection” is a 12FYP new strategic emerging industry. Currently, the three coal majors, China Coal, Shenhua Energy and Yanzhou Coal spend less than 1% of their total revenue on environmental protection. In 2011, these three collectively spent RMB2.27 billion or USD345million on the environment. This might look like a lot, but note that this is the environmental spend of which water is a component. The water spend was not disclosed. 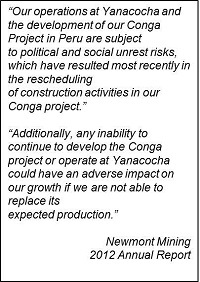 Even then, US$345 million spend on environment by the three coal majors pales in comparison to the spend on water by a single company, Newmont Mining: US$440million on water reservoirs for downstream users, as part of its bid to regain their mining license for its Yanacocha Conga gold mine in Peru. USD440million might seem steep compared to China’s spend but it is a fraction compared to a potential write-off of the mining operations worth US$4.8 billion. The mining licence was revoked by Peru’s National Water Authority on the grounds of a poor historic record polluting the Rio Grande. Elsewhere, in South Africa, Anglo-American is working on phase 2 of the eMalahleni water reclamation plant, which treats groundwater from mining operations and provides water to the local community. Phase 2 plans to increase the capacity of the plant and will cost Anglo American a further R732 million (US$73.5 million); Phase 1 was a R300 million (~US$30 million) initiative with BHP and the local government. (See a graphic of how this works here). Anglo American has also committed US$96m to build a desalination plant at the Mantoverde copper mine in Chile to provide 100% of the region’s current and future water needs. When asked about whether China Coal is worried about water, Zhou Dongzhou, of China Coal responded saying “we are not worried at present, our mines are underground and therefore we are able to make use of deep groundwater”. Clearly, they did not consider water as an issue/risk. But with the new guard focused on a groundwater crackdown and the possibility of more rain in the North, could China’s coal industry be in for a rude awakening? Sure, more water in the North should be good for coal as 85% of China’s coal reserves lie in the North, but then 95% of China’s coal is mined underground and more rain in the North could lead to flooding of mines. Flood protection was something that the North did not have to worry about before. Again more spend. 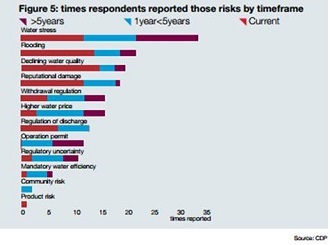 According to a report published by CDP, “Metals & Mining: a sector under water pressure” in July 2013, the mining universe of 57 metals & mining companies surveyed, classified flooding as the #2 most important water risk currently, in the medium & long term. The current #1 risk was declining water quality but in the medium to long term, water stress came out top. Note that the 57 companies in the report did not include a single Chinese metals or mining company despite China’s water risk. In the face of changing weather and increasing water scarcity, reliance on past trends and experiences may longer work. With limited water resources, miners need to consider other users of water be it agriculture, industry or the community in the province. Companies and investors should look beyond the mining operations lest face the risk of being blindsided by social movements and government action like Newmont Mining: an expensive lesson that could have been avoided in hindsight. More investment in protecting water in mining seems inevitable if China was to continue to pursue energy security. With hydro running into tough weather, and commercial gas production a while away, there may be no other choice but coal. With the Chinese government seeming bent on improving industrial water efficiency, plus the fact that coal and coal-related industries account for over 50% of industrial water use, it makes sense to focus on the whole coal chain. Don’t just take our word for it, check out the below graphic from Goldman Sachs’ China Growing Pains – Industry Position & ESG to define leadership report. Margins will come under pressure and balance sheets will need to be shored up. The slowdown in the economy provides the sector a window of opportunity to hit “reset” in dealing with water. The question is where is this money going to come from? Streams of Gold: Water-for-Mining: Olivia Jensen, Global Water Intelligence’s Asia Editor on why conditions are ripe for investment and innovation in the water-for mining sector projected to grow to USD13.6billion by 2016. 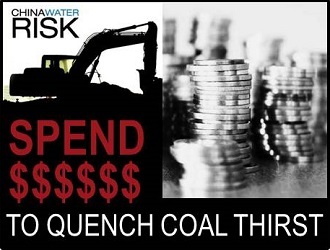 Water for Coal: Thirsty Miners? : With up to 83% of China’s coal reserves in water stressed & scarce regions, the recent CLSA report asks if there is enough water to grow coal production. If not, what are our options? Debra Tan expands. Coal-to-Chemicals: Shenhua’s Water Grab: Greenpeace’s Calvin Quek explains why Shenhua’s coal-to-liquds plant in Inner Mongolia could be facing significant financial & environmental headwinds due to rising water risks. Food, Weather & Water Heading North: Global weather patterns have shifted with major implications for agriculture. Find out what it means if for the sector if food, water and weather are all heading North in China. China Hydro: Tough Weather Ahead: Could a shift in weather patterns mean that droughts in the normally water-rich South are here to stay? Could this derail China’s aggressive hydro expansion in Yunnan & Sichuan? Debra Tan expands.